Letter: February 2010 | InterSolve Group Inc.
On February 26, 2010, the Administrator of the National Aeronautics and Space Administration (NASA), Charles F. Bolden, Jr. presented Edward R. (Ted) McPherson, Chief Executive Officer of InterSolve Group, with the NASA Exceptional Public Service Medal at NASA Headquarters in Washington, D.C. 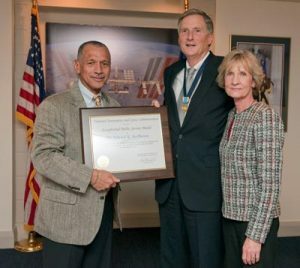 This prestigious award recognizes Mr. McPherson “For exemplary leadership, dedication, and commitment to NASA as a member of the National Aeronautics and Space Administration Advisory Council” from November 2005 to September 2009. Nationally known for achieving valuable results, Mr. McPherson serves as a leader and strategic advisor for chief executives of Fortune 100 companies, Forbes 400 entrepreneurs, and major investors as Chief Executive Officer of InterSolve Group, Inc., the firm he founded in 1991 known for JUST-IN-TIME TALENT™. He was appointed by President George W. Bush and confirmed by the Senate as Under Secretary of Education for the United States from 2004-2005 and Chief Financial Officer of the United States Department of Agriculture from 2001-2004.